Börngen Ernst was born the 7th of February 1916 at Meuselwitz in Thüringen. On the 27th of June 1940, he was assigned to 4./JG 27. He claimed his first victory during the Battle of Britain on the 18th of August 1940, “the hardest day”, by shooting down two spitfires over Selsey Bill. Börngen then took part in the Balkan Campaign in April 1941. He claimed a Greek Gladiator near Kalambaka on the 15th of April 1941. After the end of this victorious campaign, Börngen is transferred to the Eastern front with his unit to take part in the operation Barbarossa in June 1941. He claims the destruction of two DB-3 bombers on the 25th of June 1941. In late September 1941, II. / JG 27 is transferring to North Africa in order to support Rommel's troops. At the end of 1942, Börngen expanded his victories with 13 British fighters and Blenheim bombers. On the 20th of May 1942 he was appointed Staffelkapitän 5./JG 27. On the 11th of July, he shot down a Spitfire but he himself was also damaged and lands his Bf 109 F-4 Trop (102 W.Nr. 03) "Black 3", crashlanding at El Alamein. 20th of September, Börngen is wounded in aerial combat. Ernst led 5./JG 27 during the tough Italian Campaign. On July 16, 1943, Oberleutnant Börngen claims a B-24 USAAF for its 28th victory but his Bf109 G-6 Too (183 W.Nr. 71) is again hit by defensive fire bombers. He was again wounded and made another crash landing. After recovering from his injuries, Börngen is placed as an instructor at Jagdgruppe Süd. In March / April 1944, he transferred to Geschwaderstab./JG27 and then to Stab III./JG27 as part of the defense of the Reich (Reichsverteidigung). The 13th of April 1944, Börngen becomes Staffelkapitän of 2./JG27. Later on the 13th of May 1944, he was promoted to Hauptmann Börngen Gruppenkommandeur of I./JG27. Six days later Börngen voluntarily strikes a heavy bomber B-24 over Helmstedt aboard his Bf 109 G-6 (W.Nr. 441 101). He managed to bale out but he loses his right arm in the incident, resulting in his removal from active operations. 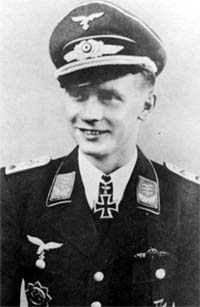 At the time of his withdrawal, Ernst Börngen was credited with 41 victories in 450 missions. He recorded two victories over the Eastern front. Of the 39 victories recorded over the Western front, 16 were four-engine bombers. Additionally, Börngen recorded 24 unconfirmed victories.